The trick to truly achieving that elusive flawless face is having the right tools. Right now I am loving the Real Techniques by Sarah Chapman brushes. Sarah Chapman is a pro makeup artist who alongside her sister Nic has a hugely successful youtube channel Pixiwoo, DEFINITELY make sure to check it out! The line is colour coded to help make application even easier. For base products use the gold brushes purple for the eyes and pink to finish your look. The stippling brush has to be one of my ALL TIME favourite beauty products in the whole entire world. This is the only brush for me when it comes to applying foundation. I've used traditional foundation brushes in the past and found they left a lot to be desired, not quite blending the product into my skin leaving a streaky effect behind. However, this brush is a godsend for creating that flawless airbrushed look. Simply put the foundation onto your hand, dip in your brush, and buffer into your skin with small circular motions. The result: Magazine front cover worthy skin! Considering my intense love affair with the stippling brush it was only natural I went out and bought three new brushes from the collection! The Blush Brush claims to contour and define your cheeks and it does not disappoint! I am a bit of a novice when it comes to contouring, for the past 21 years I have simply accepted there was not a lot I could do with my moon shaped face. It was really Keyvn Aucoin's Scuplting Powder which opened up my eyes to the possibility of cheekbones, and with this little baby it could not be easier! 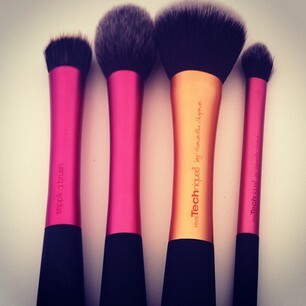 The brush is the perfect shape for defining, blending and contouring, and super soft to boot! The Powder Blush is a large fluffy brush meant for applying powders and mineral foundations. I am not a lover of mineral foundations, I just don't think they provide enough coverage for my spot prone skin. I also prefer to use a Kabuki to apply my powder, however I think this brush is just perfect for applying bronzer! Especially if, like me, you love that sunkissed glow all year round. Now that can be quite difficult to achieve with the schizophrenic British weather, but this brush makes applying your bronzer evenly a breeze! Say goodbye Umpa Lumpa orange and hello St Tropez glow. Finally my last in the collection the Setting Brush. The brush is meant to create the finishing touches to your look, adding a controlled dusting of powder where needed. I love this brush for powdering under my eye area, as the concealer there always seems to be the first to go. It is also great for powdering around your nose. I have huge pores around this area and find this brush irreplaceable in terms of getting into those hard to reach places. Furthermore, It can also be used to be apply highlighter along the cheek and brow bones, its large enough to make a noticeable difference, but not to big to make you look like a glitter ball! The Real Techniques brushes are made out of Taklon bristles which are synthetic, so the brushes are 100% cruelty-free. They wash well, and I find they dry much quicker than my Bobbi Brown brushes. I haven't encountered any problems with shedding, which is the main reason why I wanted a switch up from my Bobbi Brown brushes, they used to leave tiny black bristles all over my face, it looked like I was losing my eyelashes! You can buy these brushes in sets. The Starter Set contains five eye brushes and retails for £21.99. Included in the set is a base brush, deluxe crease brush, accent brush, eyeliner brush and a brow brush. I haven't tried these yet as I am quite content with my Bobbi Brown eye brushes but I am definitely going to look into them! The Core Collection also retails for £21.99 and contains detailer, foundation, buffing, contour brushes as well as a case. I would recommend this to those just starting their brush collection, who are not to sure yet what brushes suit them. However I don't feel the collection contains the best the brand has to offer. Right now these brushes are included in Boots 3 for 2 so get down there and check them out for yourselves! What do you think have you tried any of the other brushes? Tip: Make sure to wash your brushes frequently it makes them last much longer!